Adam & Valerie » Growing Happily! 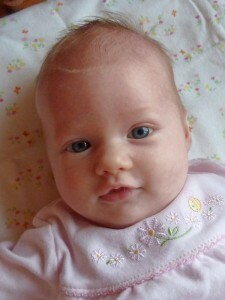 We just returned from Abigail’s two-month checkup appointment, and she is doing wonderfully! A happy, healthy baby, our little daughter brings great joy to our home. Abigail’s favorite place to play is on a blanket near the patio window where she gets lots of warm sunshine in the morning. She is learning how to use her hands and enjoys batting at little toys hanging from a mobile. Another favorite spot is on the floor in Daddy’s office. You can watch Abigail enjoying her playtime in the video below. She loves her “wiggle time” and making little cooing noises. Many friends have told us to treasure these moments because she will grow up before we know it. 🙂 In just a couple short months it is amazing to see how much she has grown! Even in the last week or so she is starting to lose that “newborn cry” and sound more like a growing little girl! My IT consulting work allows me to work from home several days a week, and I am very thankful for the opportunity to enjoy these special moments as a family.